It seemed like an ordinary day at the lighthouse, but the morning of May 11, 1890, proved to be one of the most exciting days of fourteen-year-old Maebelle Mason's life. Although it started out like any other Detroit River morning, the morning of May 11, 1890, proved to be one of the most exciting days of fourteen-year-old Maebelle Mason’s life. Maebelle was the daughter of Captain and Mrs. Orlo James Mason, and Captain Mason was the keeper of the Mamajuda Island Light in the lower Detroit River across from Wyandotte, Michigan. After spending her early childhood in St. Louis, Missouri, where she was born in 1875, Maebelle came with her parents to the maritime world of the Great Lakes and light keeping. Men dominated the 19th century lighthouse world as the primary keepers and wage earners. Sometimes their wives took over as keepers when they became ill or died, but the records show a majority of male light house keepers. The records don’t always reveal that women and children played equally important roles in light keeping and that tending the light was indeed a family affair. Occasionally women like Abigail Becker and Katie Walker and their lifesaving deeds were documented, but many lighthouse women lived, performed brave deeds, and died unrecorded and unrecognized except by their families and friends. Maebelle Mason was young, brave, and her father was a lightkeeper so her contributions were recognized. In June 1885, Captain Orlo J. Mason was appointed keeper of the Mamajuda lighthouse in the Detroit River. 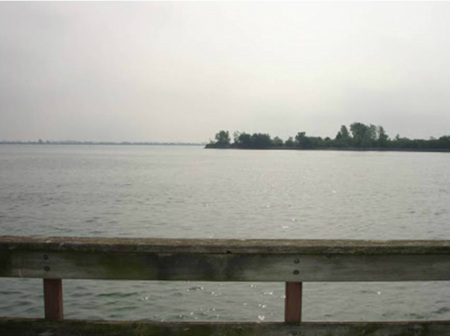 Mamajuda Island, named for a Wyandotte Indian woman who established her fishing camp there, stood at a junction of channels and long stretches of shoals that extended from the Island to the City of Wyandotte. In 1849, the United States Government built a lighthouse on Mamajuda Island and the keeper and his family lived on a small farm on the island. Maebelle Mason had spent her childhood years learning self reliance and reliability from her mother and father so she was ready for the task that she faced on the morning of May 11, 1890. That sunny morning in May, Captain Mason went to mainland Detroit for supplies, leaving his wife and daughter Maebelle alone at the lighthouse. He took the government boat, leaving a small, flat bottomed skiff lying on the island beach. The C.W. Elphicke chugged on and Maebelle and her mother dragged their skiff into the water. Reluctantly her mother agreed to let Maebelle rescue the man all by herself. Maebelle maneuvered the skiff into the river and floated with the strong current. She saw the man still clinging to the rowboat. Maebelle rowed hard and a mile later, drew even with the overturned boat. Tugging and pulling at the man’s clothing, she dragged him into her skiff and rowed back to the light house. Mother and daughter took him inside and made him comfortable. By the time Captain Mason returned from the mainland, the man had nearly recovered from his ordeal. Word of Maebelle’s daring rescue spread. The marine magazines of the day and the Detroit and Cleveland newspapers told her story. The Lighthouse Service awarded Maebelle the United States Life Saving Medal, which Commander Edwin W. Woodward of the United States Navy, presented to her. She received it at the Cadillac Hotel in Detroit during the National Convention of the Grand Army of the Republic in 1890. She accepted the medal modestly and said that she had just performed an act of humanity. For years after, all of the steamers flying the Ship aster’s Association pennant saluted Maebelle with their horns and whistles while passing the Mamajuda lighthouse. Captain Mason tended the Mamajuda Island Light for nine years and did his job so well that there was not one complaint against him. He ended his light keeping career tending the Ashtabula Harbor Light in Ashtabula, Ohio. Maebelle Mason lived a traditional woman's life after her Detroit River rescue. On June 21, 1892, she married James L. Connell, a stationary engineer. In 1896 they had a son named Orlo James, in honor of her father and a daughter Corrine in 1901. The C.W. Elphicke sank in Lake Erie off of Long Point Light on Tuesday, October 21, 1919. By 1960, high water had entirely swept away Mamajuda Island , including the light house. Only a few boulders mark the place it once stood. But the memory of Maebelle Mason, the teenage heroine, perseveres.